Nakamura – Tome Methods Slant 3B CNC Turning Center s/n C31038 w/ Fanuc System 11TE Controls, 12-Station Turret, Hydraulic Tailstock, 12” 3-Jaw Power Chuck, Coolant. Nakamura – Tome Methods Slant 3B CNC Turning Center s/n C31114 w/ Fanuc System 11TE Controls, 12-Station Turret, Hydraulic Tailstock, 12” 3-Jaw Power Chuck, Coolant. Nakamura – Tome Methods Slant 3B CNC Turning Center s/n C31102 w/ Fanuc System 11TE Controls, 12-Station Turret, Hydraulic Tailstock, 12” 3-Jaw Power Chuck, Coolant. Nakamura – Tome Methods Slant 1M CNC Turning Center s/n C23010 w/ Fanuc System 11TE Controls, 12-Station Turret, Hydraulic Tailstock, 10” 3-Jaw Power Chuck, Coolant. Nakamura – Tome TMC-15 CNC Turning Center s/n 051115 w/ Fanuc Controls, 10-Station Turret, Hydraulic Tailstock, 16C Collet Nose, Parts Catcher, Coolant, LNS Hydrobar 6.42HS-3.3 6-Tube Hydraulic Bar Feed s/n 338611. 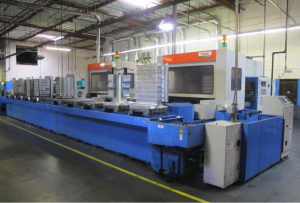 Nakamura – Tome TMC-15 CNC Turning Center s/n 04403 w/ Fanuc Controls, 10-Station Turret, 16C Collet Nose, Parts Catcher, Coolant, LNS Hydrobar 6.42HS-3.3 6-Tube Hydraulic Bar Feed s/n 33896. Nakamura – Tome Methods Slant Jr. CNC Turning Center s/n 10647 w/ Fanuc System 10TE Controls, 10-Station Turret, Hydraulic Tailstock, 16C Collet Nose, Coolant. Nakamura – Tome Methods Slant Jr. CNC Turning Center s/n 10542 w/ Fanuc System 10TE Controls, 10-Station Turret, 16C Collet Nose, Coolant. Bullard “Cut Master” 54” Vertical Turret Lathe s/n 29363 w/ 4.4-160 RPM, 5-Station Turret Head, Boring Head, Facing/Turning Head, Power Feeds, 64” Swing, 30Hp Motor, 54” 4-Jaw Chuck. Bullard “Cut Master” 42” Vertical Turret Lathe w/ Sony LH52 DRO, 5-Station Turret Head, Facing/Turning Head, Power Feeds, 56” Swing, 42” 4-Jaw Chuck. Clausing – Colchester “21” 21” x 65” Geared Head Lathe s/n LMF60SILFV/ 07791 w/ Sony LH52 DRO, 18-1400 RPM, Inch/mm Threading, Tailstock, 12” 3-Jaw Chuck, 12” 4-Jaw Chuck, Coolant. Clausing – Colchester “15” 15” x 54” Geared Head Lathe s/n 6/0055/32291DD w/ 25-2000 RPM, Inch/mm Threading, Tailstock, Trava-Dial, 5C Collet Closer, Coolant. Clausing – Colchester “15” 15” x 54” Geared Head Lathe s/n 6/0055/31720DD w/ 25-2000 RPM, Inch/mm Threading, Tailstock, Trava-Dial, Aloris Tool Post, 10” 6-Jaw Chuck, Coolant. Clausing – Colchester “13” 13” x 42” Geared Head Lathe s/n LMR40SIL-FV/13965 w/ Sony LH52 DRO, 30-2500 RPM, Inch/mm Threading, Tailstock, 5C Collet Closer, Trava-Dial, 10” 40Jaw Chuck, 8” 3-Jaw Chuck, Coolant. Hitachi Seiki mdl. 5A Turret Lathe w/ 17-1500 RPM, 6-Station Turret, Power Feeds, 12” 3-Jaw Chuck, Coolant. Saimp KS-155 Geared Head Lathe w/ 45-1500 RPM, 8” 3-Jaw Chuck. 1995 Mazak Mazatech ULTRA 650 4-Axis Multi Pallet CNC Horizontal Machining Cell s/n 119213 w/ Mazatrol M-32 Controls, 120-Station ATC, CAT-50 Taper Spindle, Tool Presetter, 4th Axis Thru Pallets, 24 ¾” x 24 ¾” Pallets, Rigid Tapping, High Flow Coolant System, Hand Wheel, Chip Conveyor. 1994 Mazak Mazatech ULTRA 650 4-Axis Multi Pallet CNC Horizontal Machining Cell s/n 112502 w/ Mazatrol M-32 Controls, 120-Station ATC, CAT-50 Taper Spindle, Tool Presetter, 4th Axis Thru Pallets, 24 ¾” x 24 ¾” Pallets, Rigid Tapping, High Flow Coolant System, Hand Wheel, Chip Conveyor. 1994 Mazak 16-Pallet Transfer Cell s/n 112502 w/ Mazak PMC Controls, (4) Loading Stations, (16) 24 ¾” x 24 ¾” Pallets. 1996 Mazak Multiplex 630 CNC Robotic Twin Spindle – Twin Turret Turning Cell s/n 121867 w/ Mazatrol T PLUS Controls, Tool Presetters, (2) 12-Station Full Live Turrets, 10” 3-Jaw Power Chucks, Synchronized Spindles, Full “C” Axis, Auto Partition, Mazak FLEX-GL200N Robotic Parts Unloader, Chip Blaster High Pressure / High Volume Coolant System, Chip Conveyor. 1994 Mazak Multiplex 625 MARK II CNC Robotic Twin Spindle – Twin Turret Turning Cell s/n 112236 w/ Mazatrol T PLUS Controls, Tool Presetters, (2) 12-Station Full Live Turrets, 10” 3-Jaw Power Chucks, Synchronized Spindles, Full “C” Axis, Auto Partition, Mazak FLEX-GL100N Robotic Parts Unloader, LNS Quick Load Automatic Bar Loader / Feeder s/n 18522, Chip Blaster High Pressure / High Volume Coolant System, Chip Conveyor. 1995 Mazak Multiplex 620 MARK II CNC Twin Spindle – Twin Turret Turning Cell s/n 118849 w/ Mazatrol T PLUS Controls, Tool Presetters, (2) 12-Station Full Live Turrets, S-20 Collet Pad Noses, Synchronized Spindles, Full “C” Axis, Auto Partition, LNS Quick Load Automatic Bar Loader / Feeder s/n 18286, Chip Blaster High Pressure / High Volume Coolant System, Chip Conveyor. Matsuura MC-760VX CNC Vertical Machining Center s/n 870606402 w/ Matsuura Yasnac System MX3 Controls, 30-Station ATC, BT-40 Taper Spindle, 16” x 45” Table, Coolant. Matsuura MV-760V2 CNC Vertical Machining Center s/n 85034549 w/ Matsuura Yasnac System MX2 Controls, 30-Station ATC, BT-40 Taper Spindle, 16” x 45” Table, Coolant. Matsuura MC-510V CNC Vertical Machining Center s/n 910609394 w/ Matsuura Yasnac System i80 Controls, 20-Station ATC, BT-35 Taper Spindle, 15” x 30” Table, Coolant. Matsuura MC-510V CNC Vertical Machining Center s/n 890807647 w/ Matsuura Yasnac System MX3 Controls, 20-Station ATC, BT-35 Taper Spindle, 15” x 30” Table, Coolant. Matsuura MC-500V2 CNC Vertical Machining Center s/n 86035336 w/ Matsuura Yasnac MX2 Controls, 20-Station ATC, BT-35 Taper Spindle, 15” x 34” Table, Coolant. Matsuura MC-500V2 CNC Vertical Machining Center s/n 86015163 w/ Matsuura Yasnac MX2 Controls, 20-Station ATC, BT-35 Taper Spindle, 15” x 34” Table, Coolant. Matsuura MC-500V2 CNC Vertical Machining Center s/n 85034665 w/ Matsuura Yasnac M5X Controls, 20-Station ATC, BT-35 Taper Spindle, 15” x 34” Table, Coolant. Proto Trak / Bridgeport 2-Axis CNC Vertical Mill s/n 215246 w/ SWI Proto Trak EDGE Controls, 2Hp Motor, 60-4200 Dial Change RPM, R8 Spindle, Chrome Ways, 6” Riser, 9” x 42” Table. Shibaura BT-10BR1PD Horizontal Boring Mill s/n 16943 w/ Shibaura Controls, Compumotor/Spaulding 2-Axis DRO, Anilam Miniwizard 2-Axis DRO, Digital Table Rotation Readout, 14-500 RPM, 4” Spindle, 44” x 49” Table. R8 Spindle, Chrome Ways, Power Feed, 9” x 42” Table. HEM-Saw mdl. 1000AH-1 12” Automatic Horizontal Band Saw s/n 278888 w/ HEM Controls, Pneumatic Clamping and Feeds, Coolant. HEM-Saw mdl. 750A 10” Automatic Horizontal Band Saw s/n 161581VB w/ HEM Controls, Pneumatic Clamping and Feeds, Coolant. Haberle mdl. H350 12” Miter Cold Saw s/n 15339099 w/ 2-Speeds, Speed Clamping, Coolant. Empire “Pro-Finish” mdl. FF-6060 Dry Blast Cabinet s/n 8177 w/ Pneumatic Side Door, Shuttle System, Dust Collection System. Cecor mdl. CE10-200/200TW Sump Cleaner / Filter and Coolant Dispenser Tank s/n 42012. Smog Hog Ceiling Mounted Fume Collector. Smog Hog and PlymoVent Fume Collection Arms. Clausing – Colchester “21” 21” x 65” Geared Head Lathe s/n LMF60SIL-FV/07791 w/ Sony LH52 DRO, 18-1400 RPM, Inch/mm Threading, Tailstock, 12” 3-Jaw Chuck, 12” 4-Jaw Chuck, Coolant.